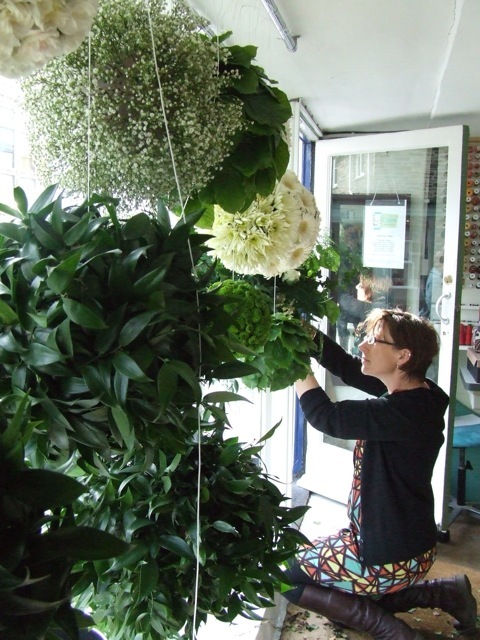 I do still do some floristry work and happily my assistant Tanya is also a fully qualified florist. 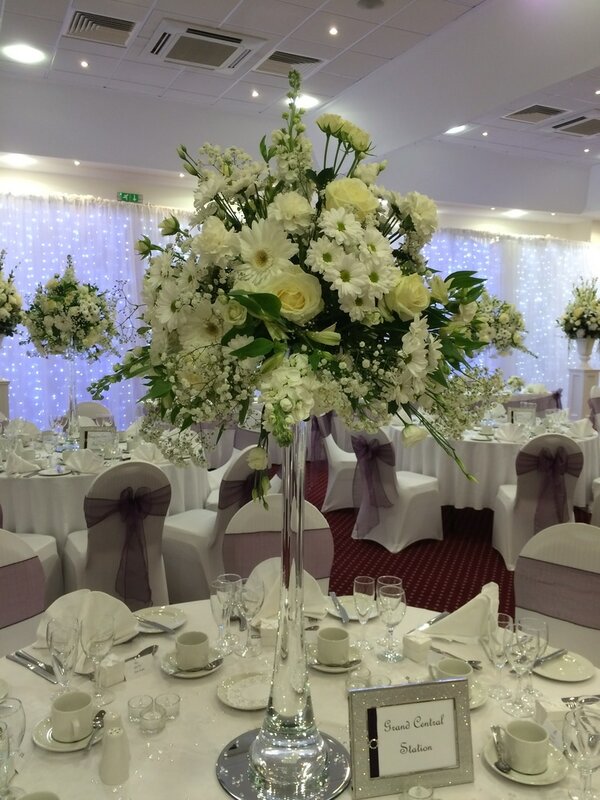 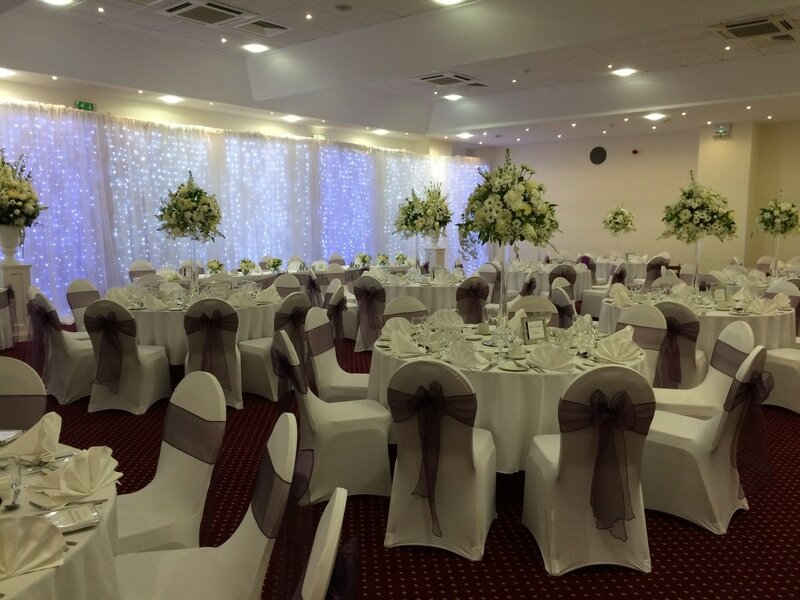 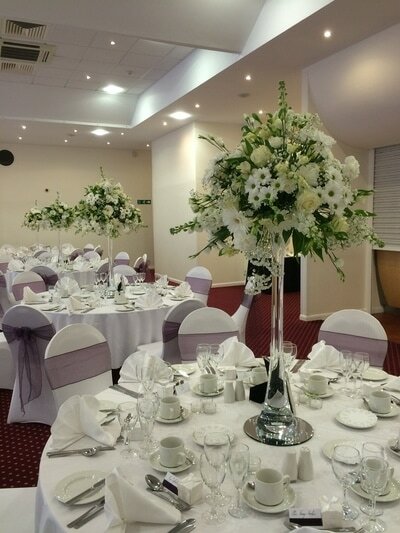 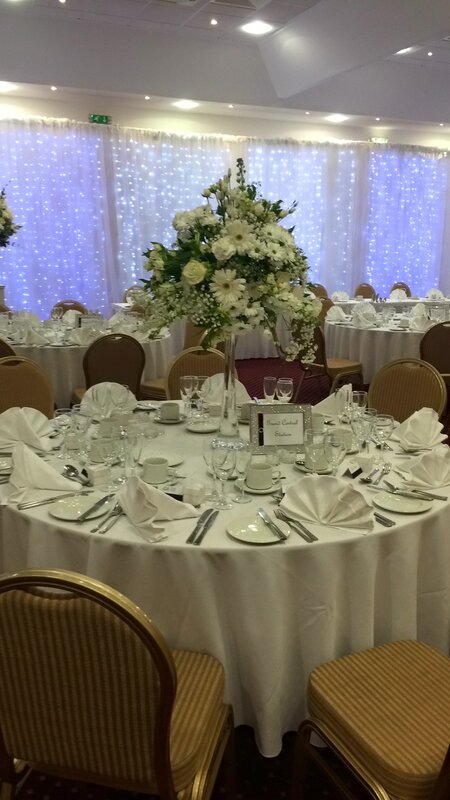 We worked on several lovely local weddings, all of them a delight to be part of. 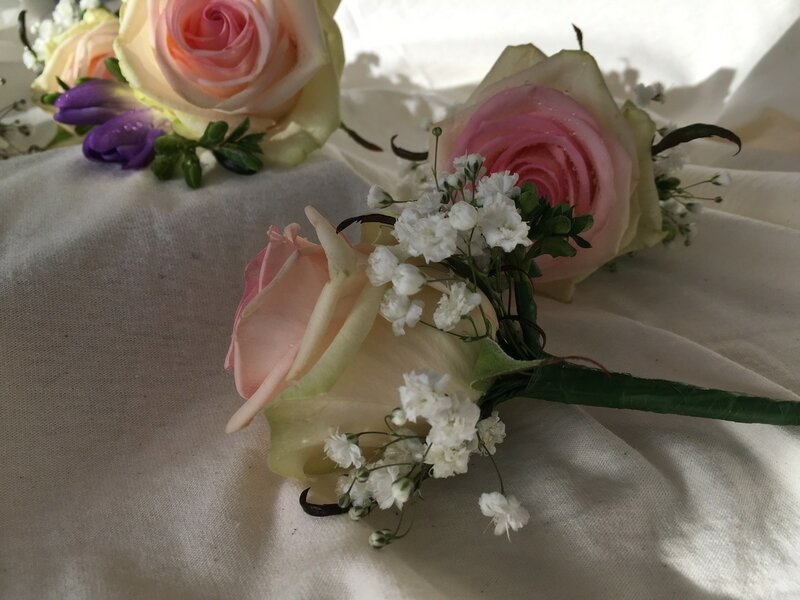 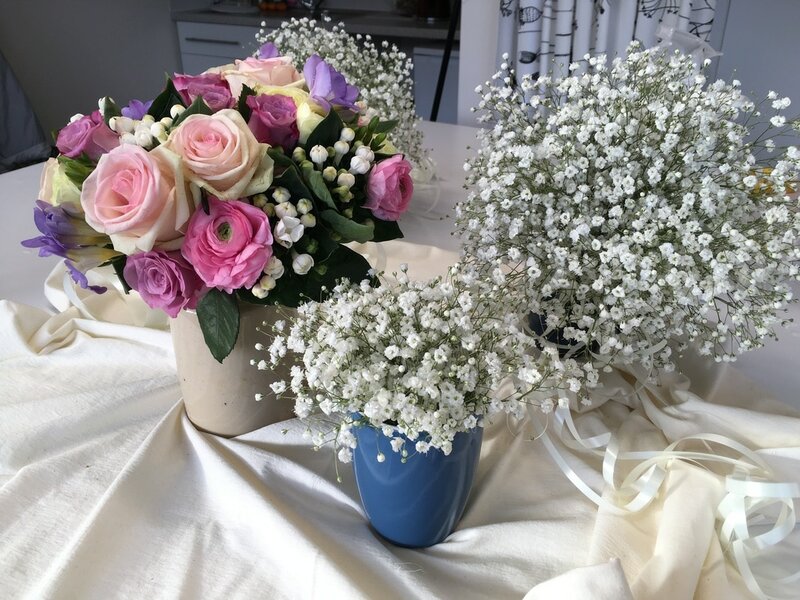 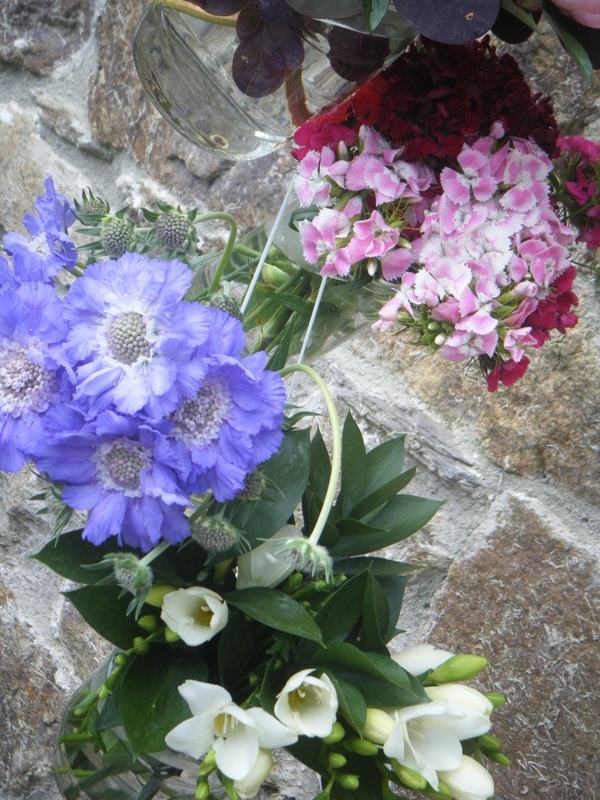 I use local suppliers and wholesalers and have done flowers for weddings at venues such as Pentillie Castle, The Horn of Plenty and The Old Chapel in Calstock. 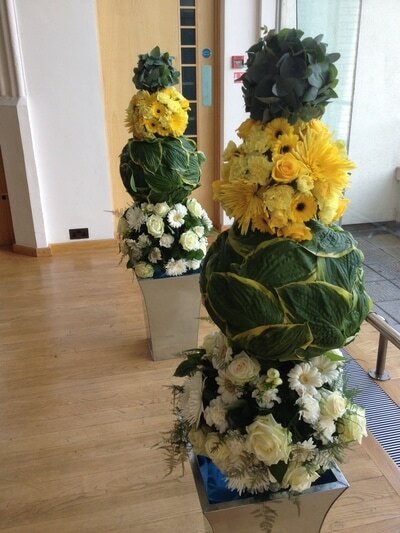 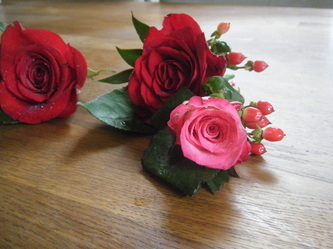 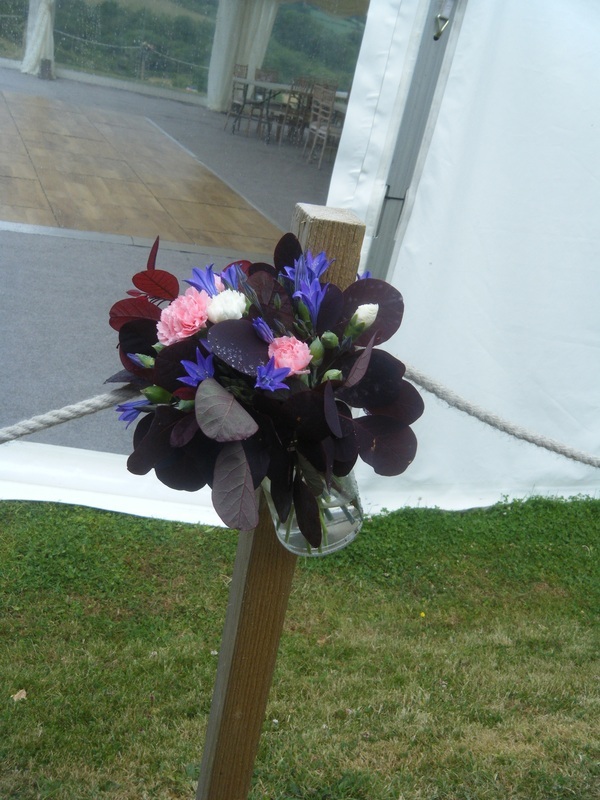 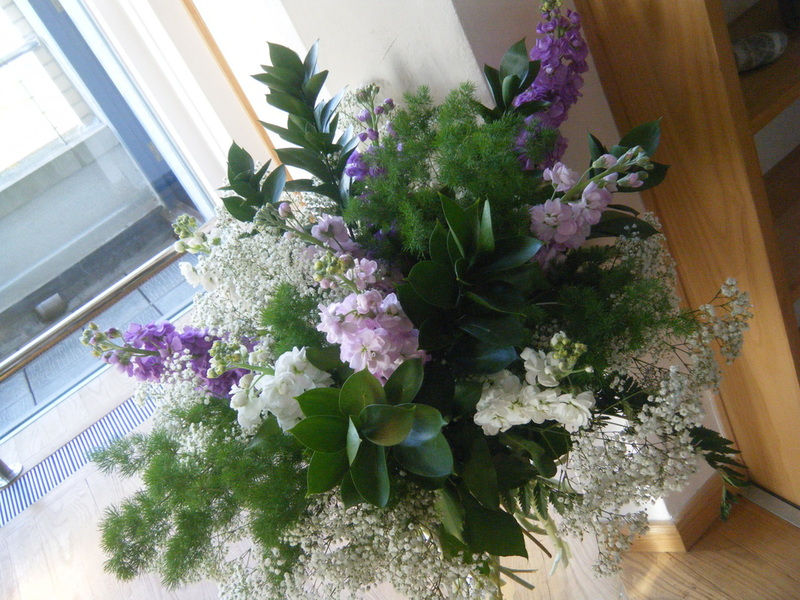 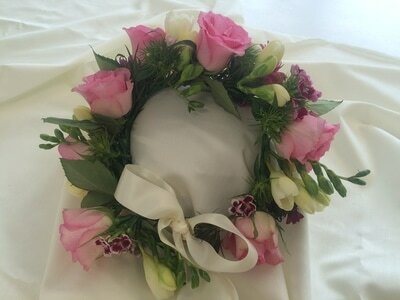 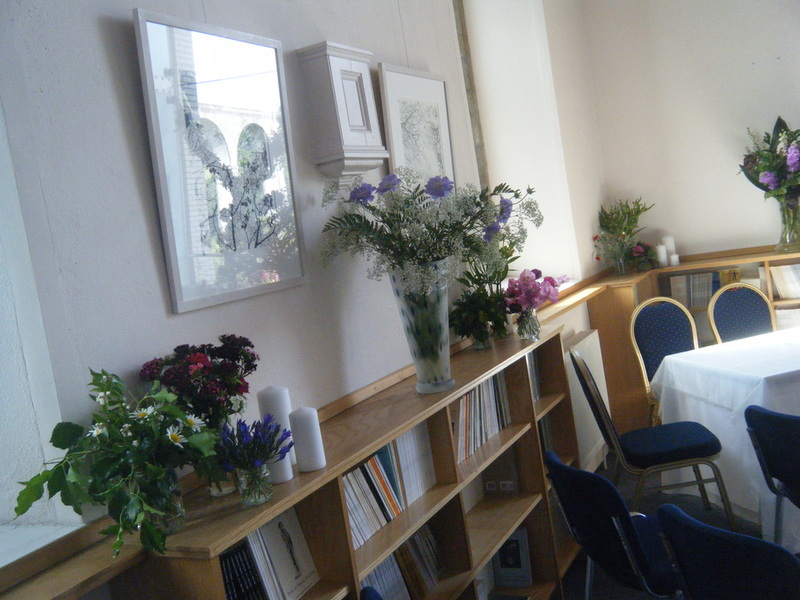 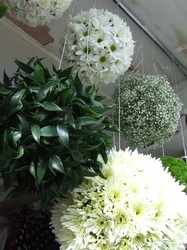 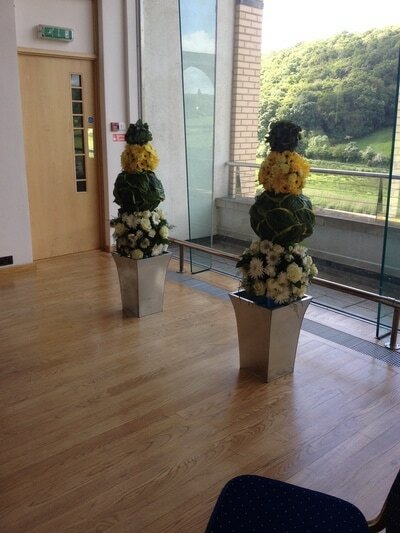 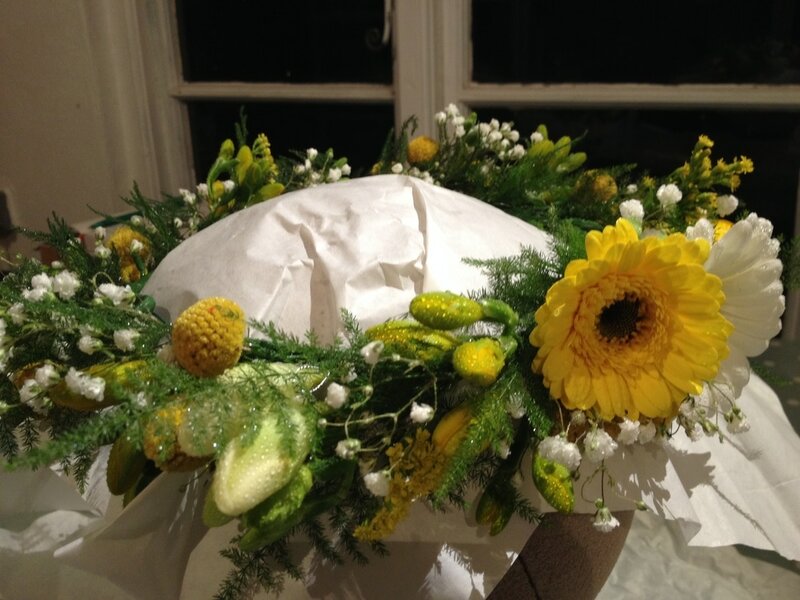 I have also provided floral work for parties, life celebrations and funerals. 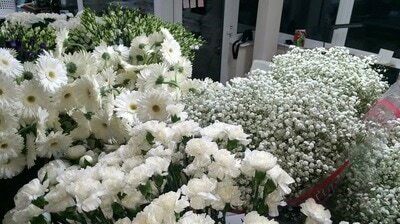 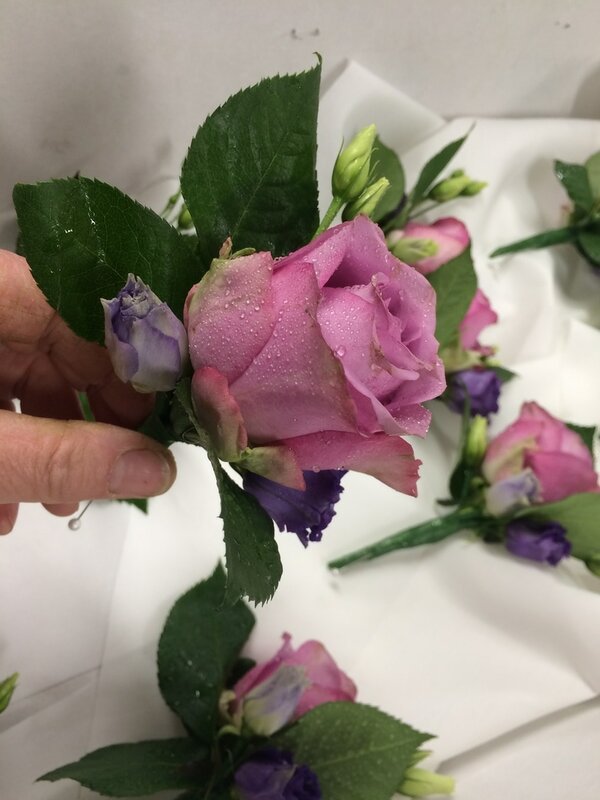 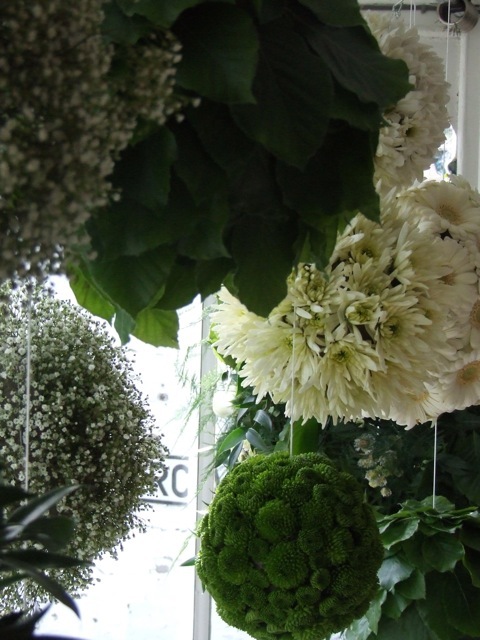 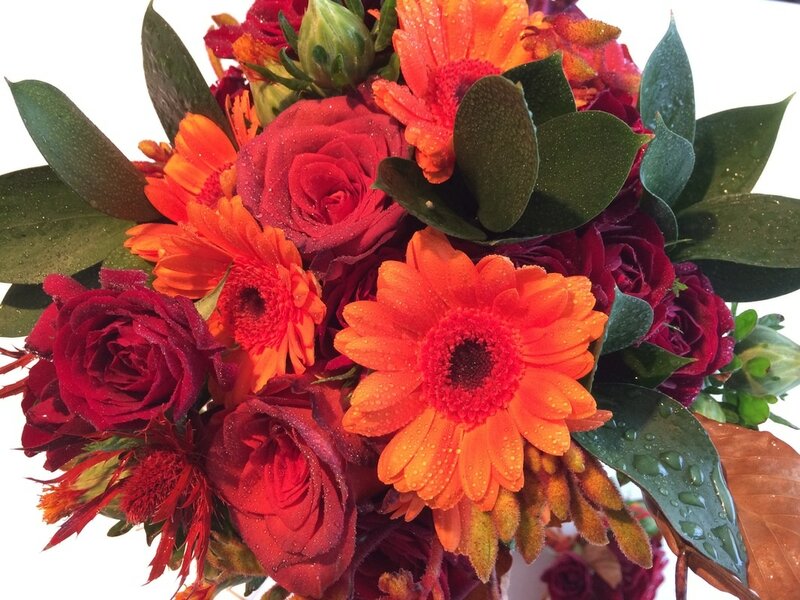 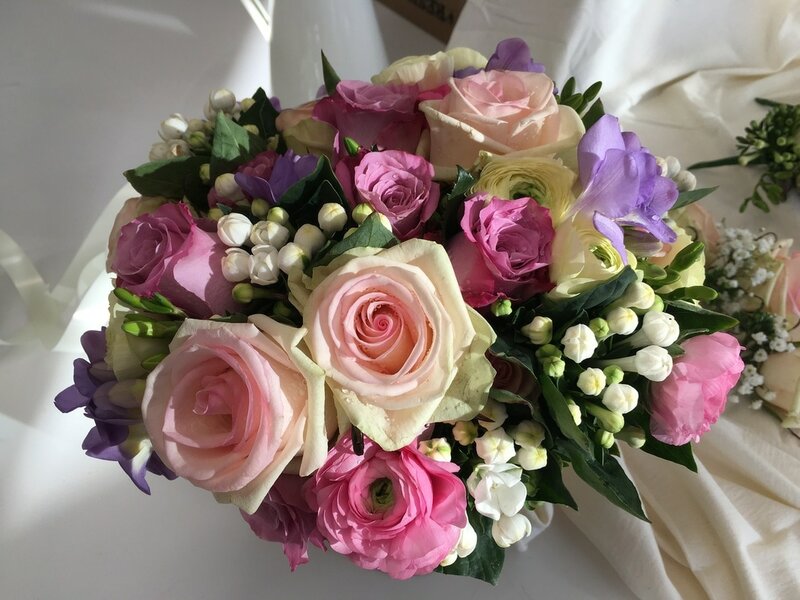 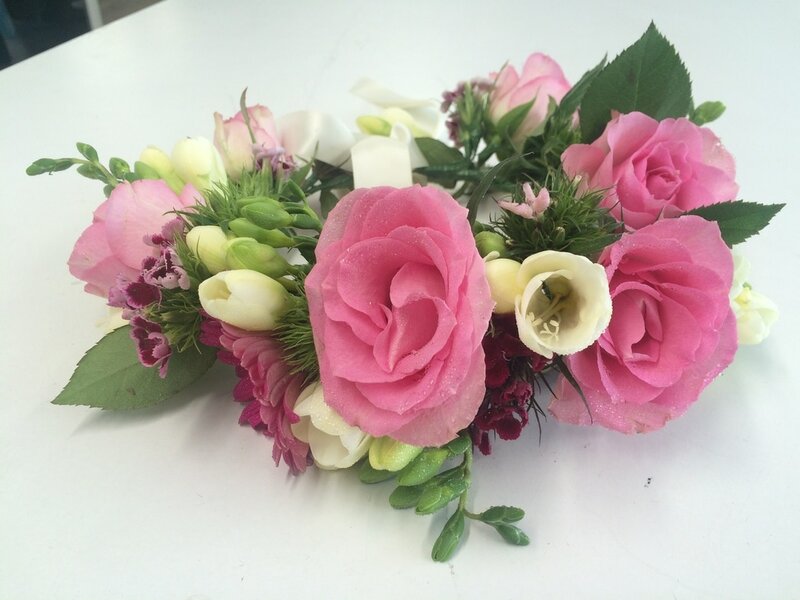 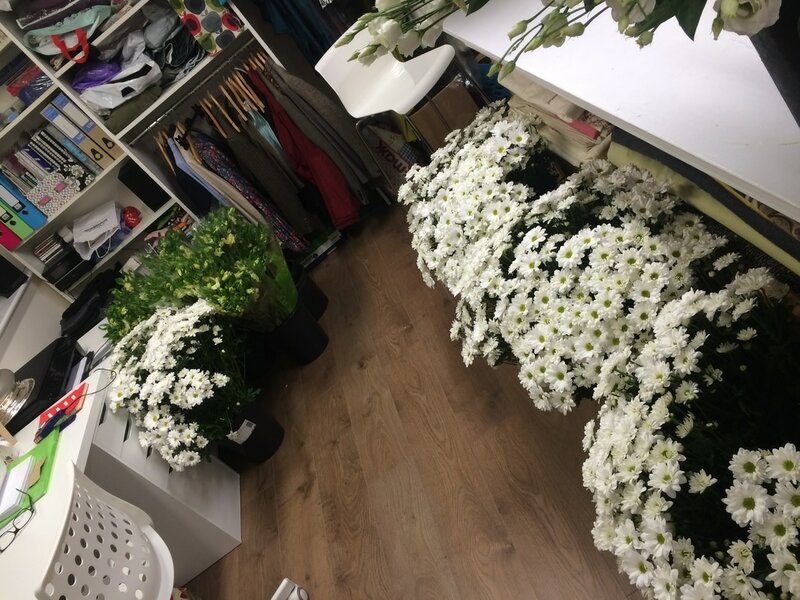 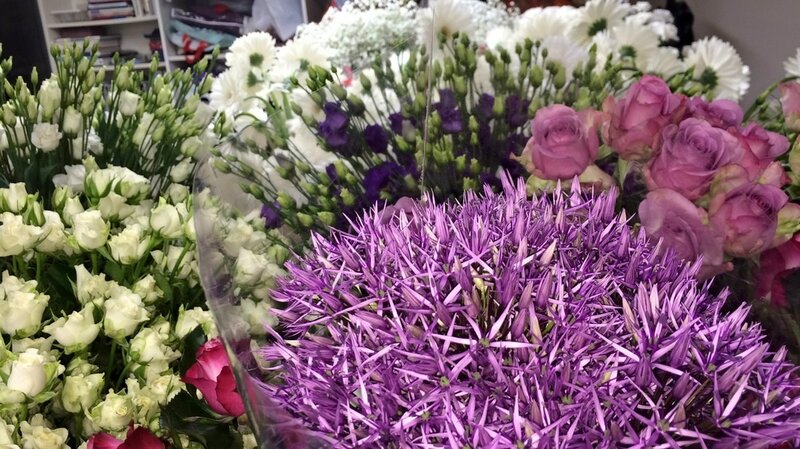 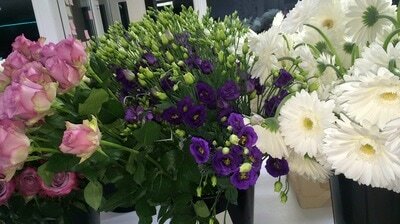 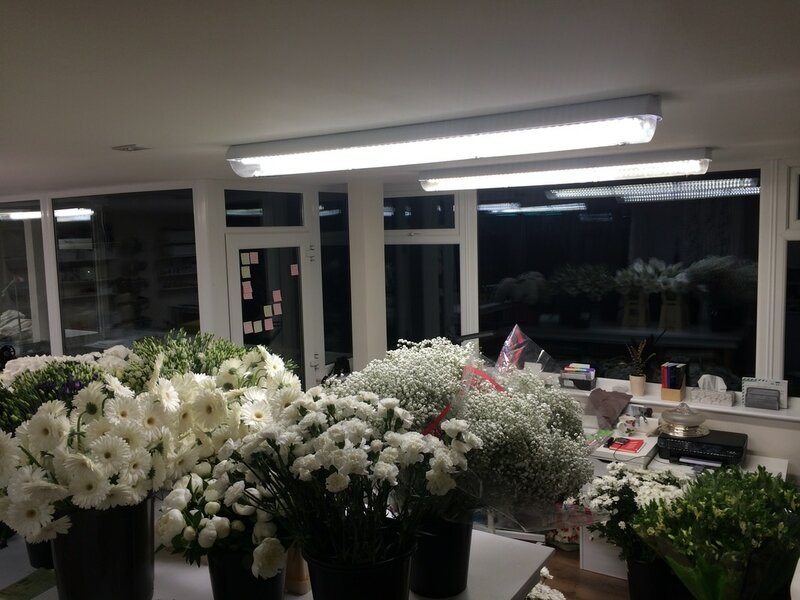 If you would like to discuss any ideas you have for floristry work, please contact me on 01822 833130 or come in and see me at the shop. 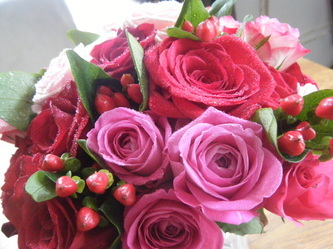 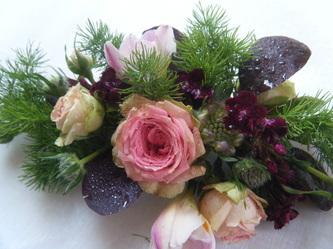 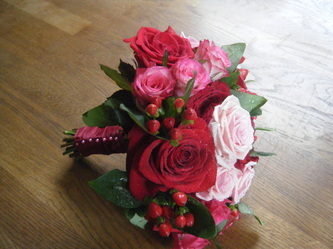 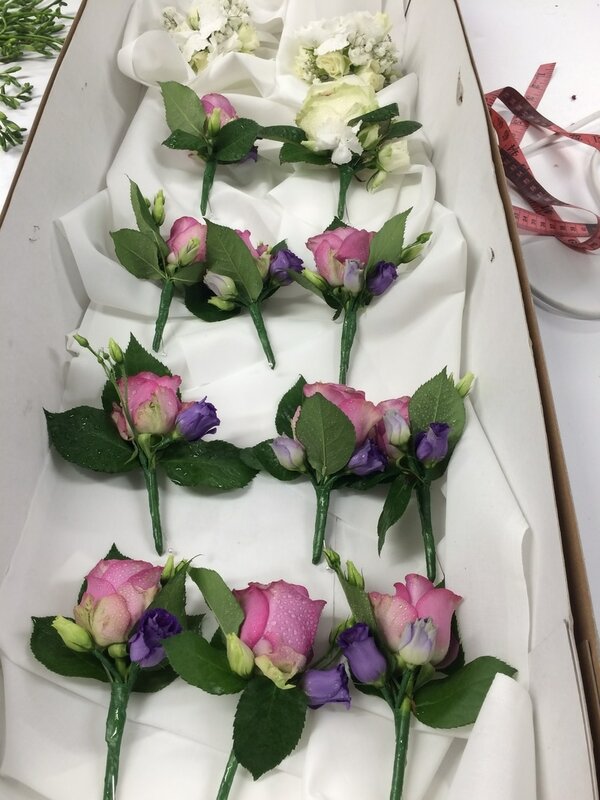 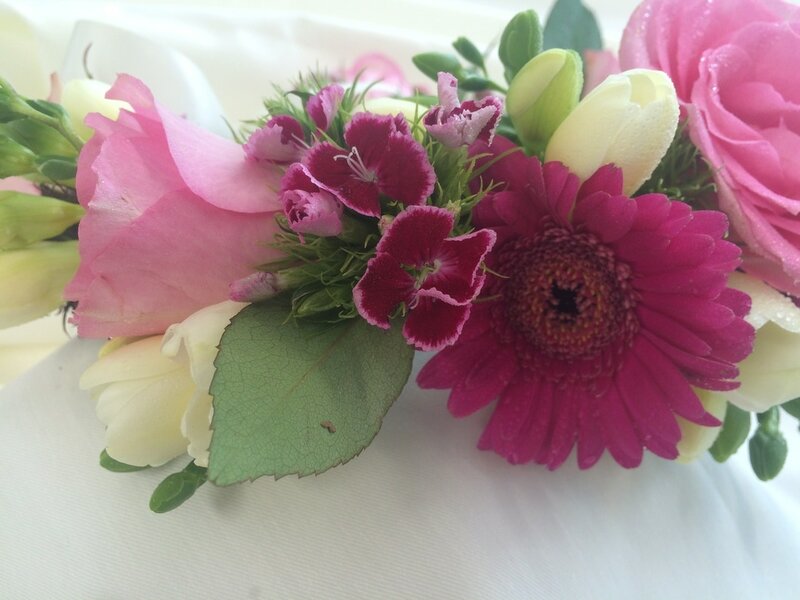 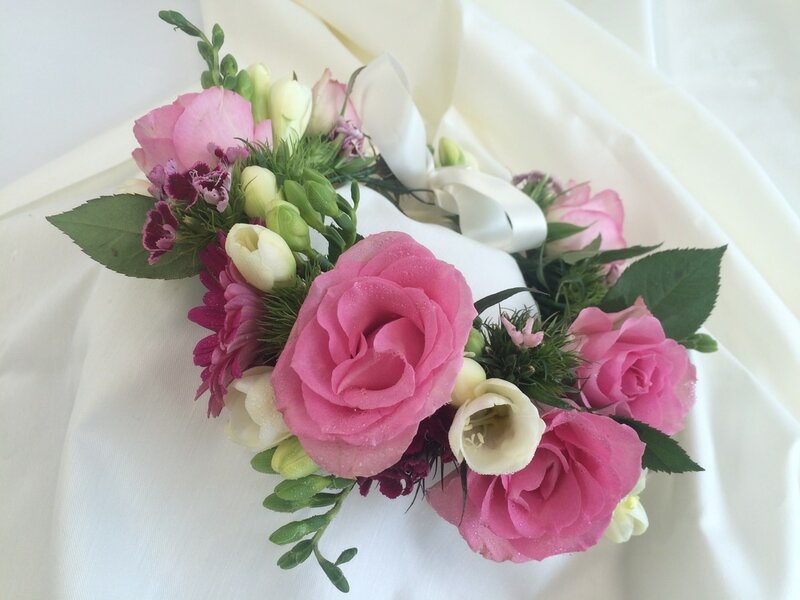 I did these flowers for a lady who had come to me for her wedding dress alterations. 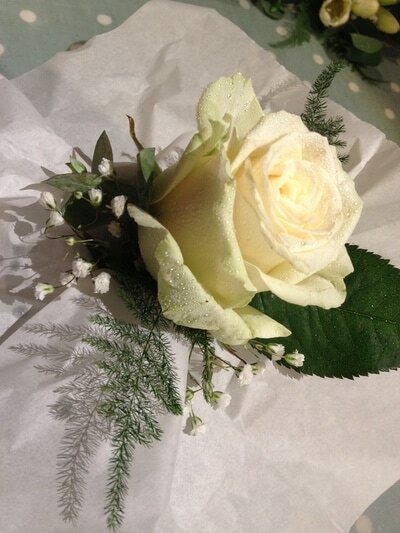 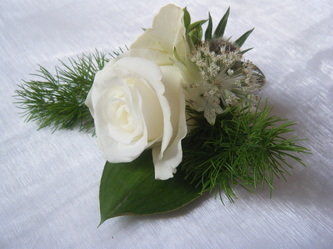 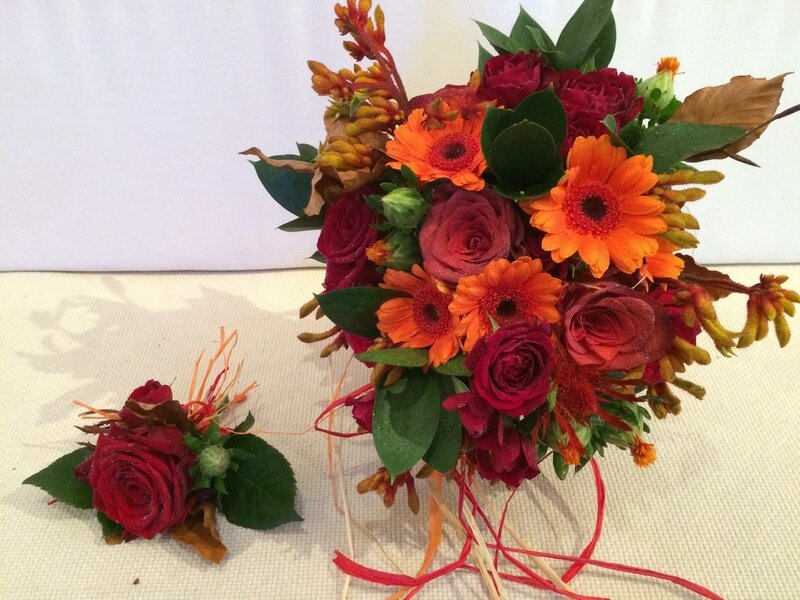 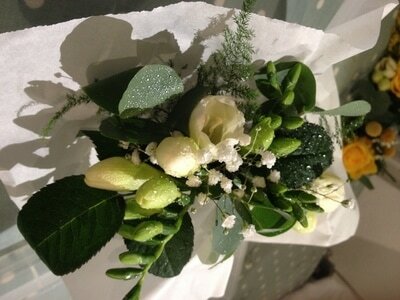 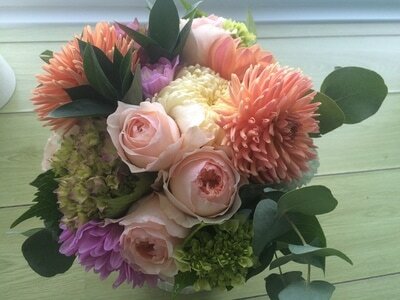 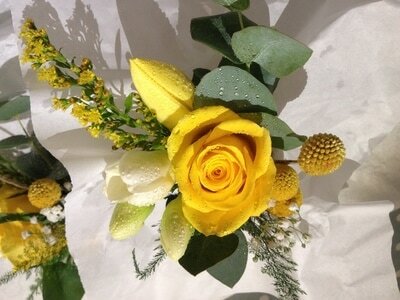 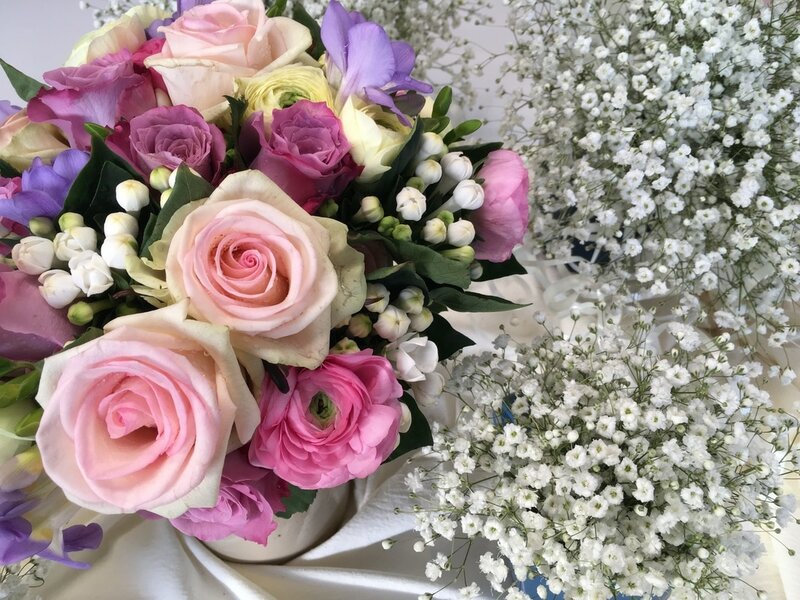 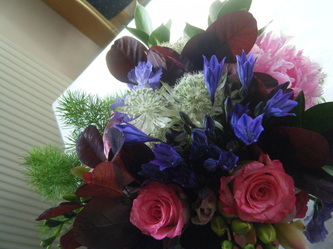 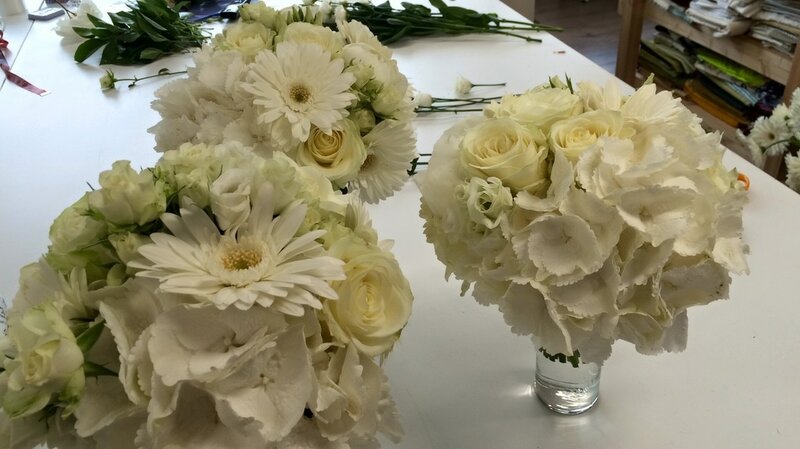 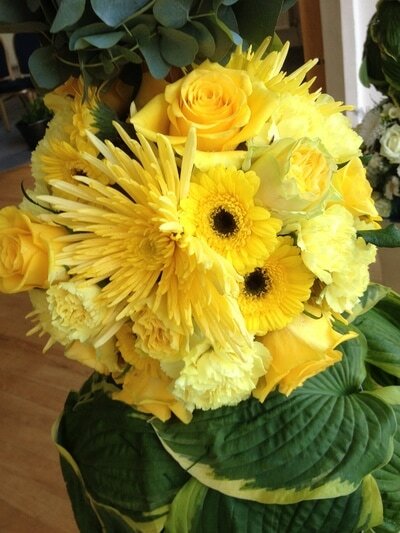 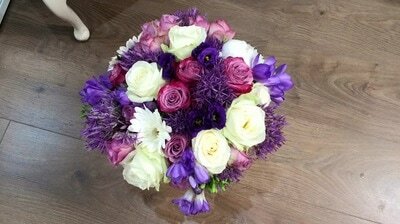 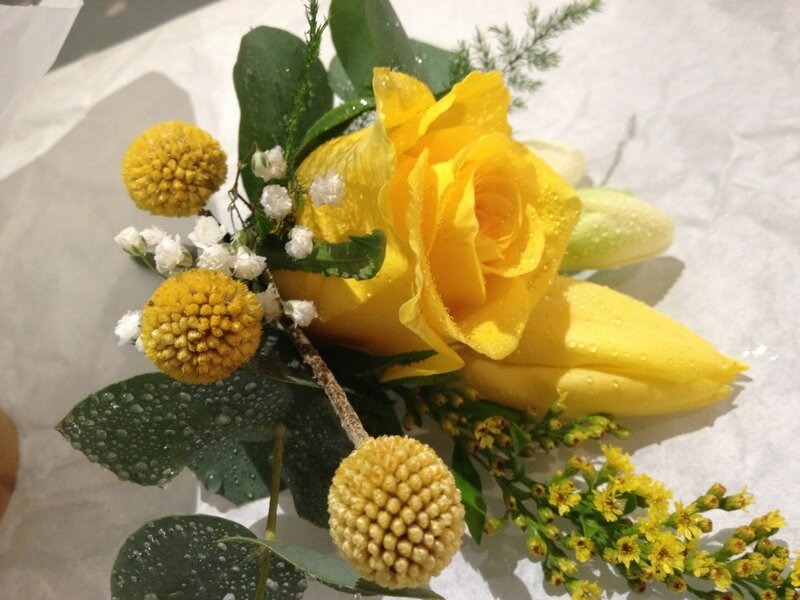 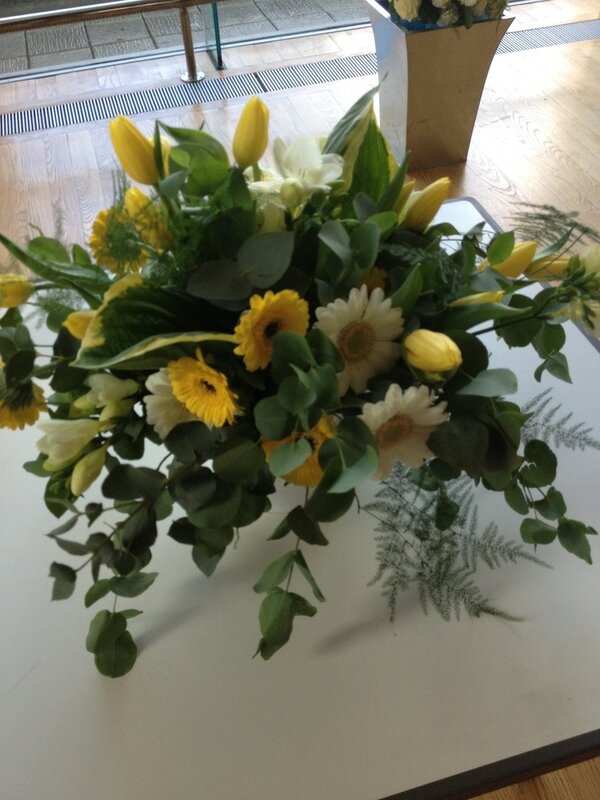 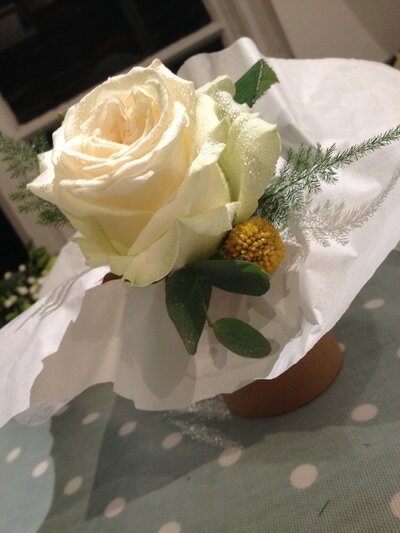 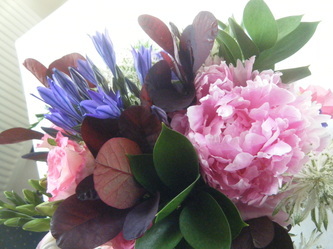 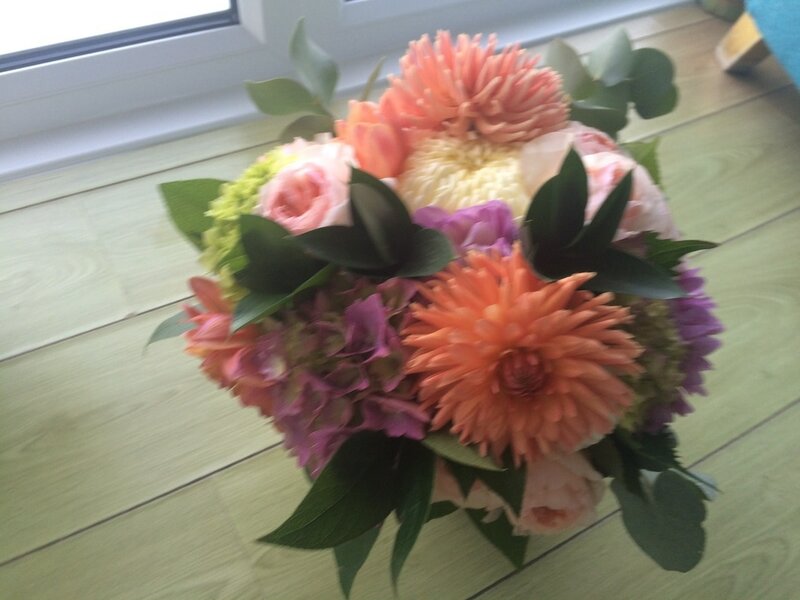 Stephanie was very relaxed about her flower choices , it was great to be trusted to so much. 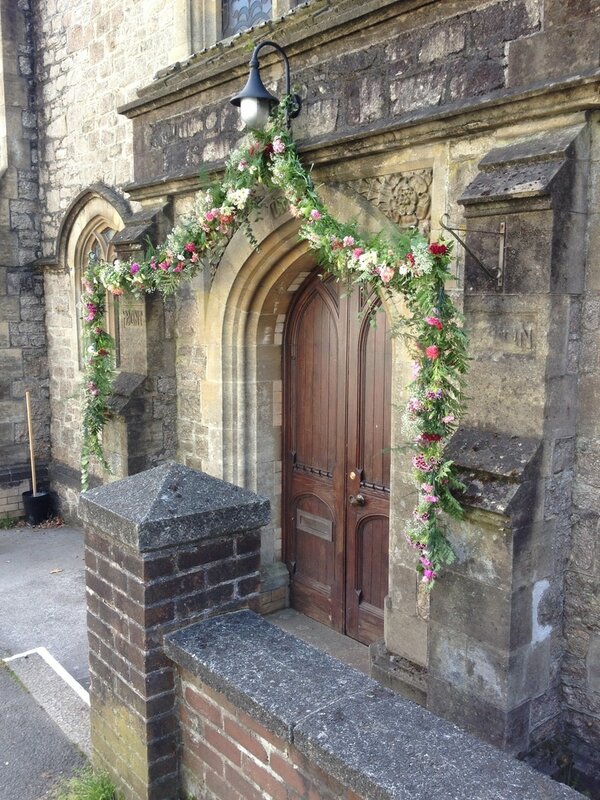 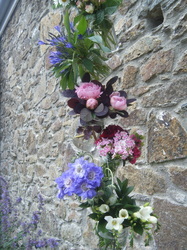 I made this garland around the door way of the Old Chapel in situ, I got lots of lovely comments from people passing by. These two lovely people had a crazy Vegas wedding and then an incredible party for all friends and family. 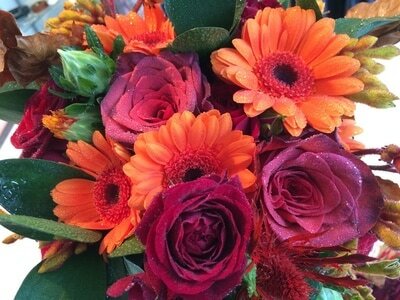 This had an autumnal theme , probably my favourite combination of colours. This wedding was held at the Bedruthen Steps Hotel in Cornwall and had a distinctly vintage feel. 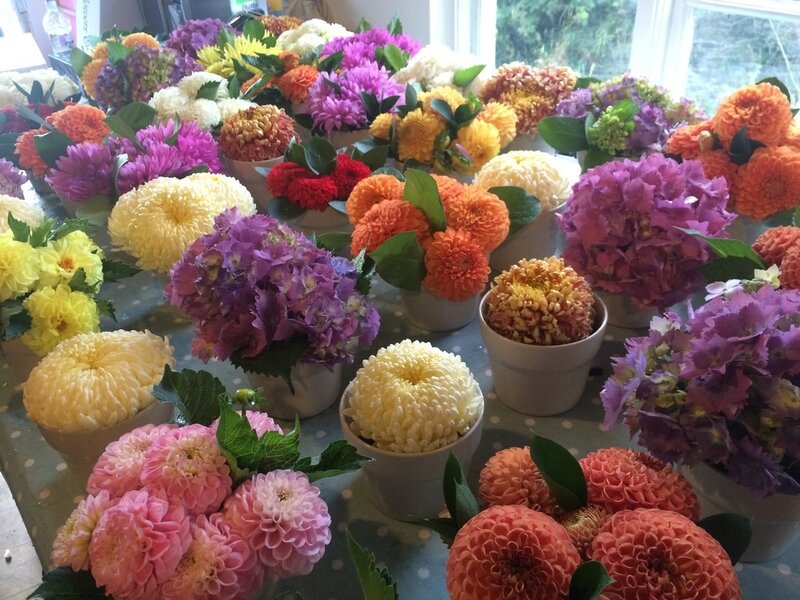 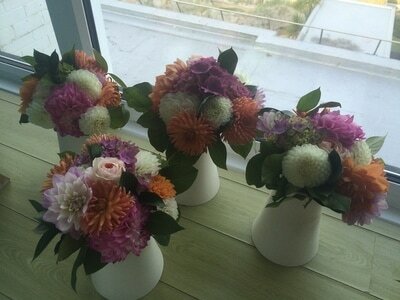 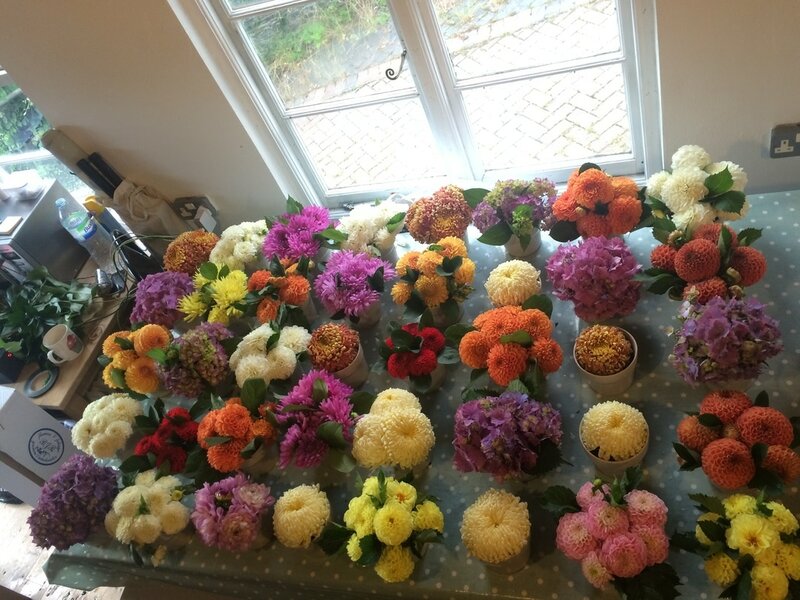 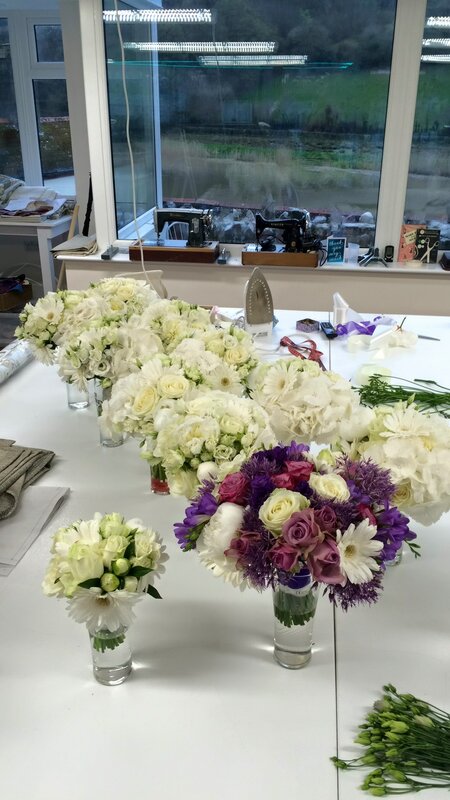 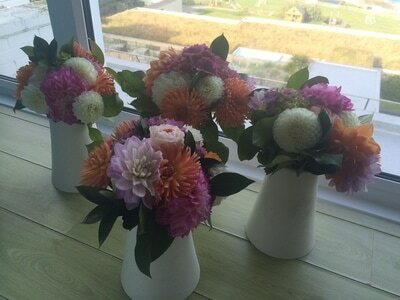 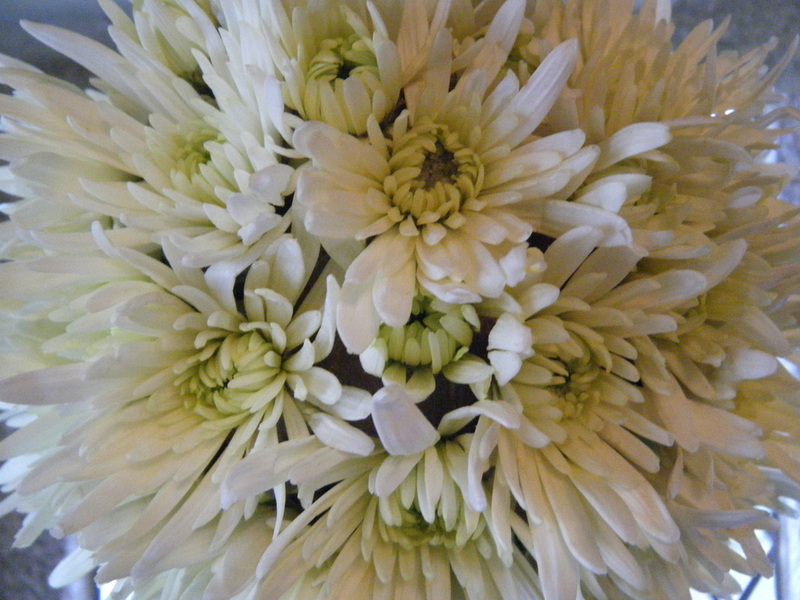 It was such a treat to,work with these flowers, I love Dahlias, the range of colours was stunning. 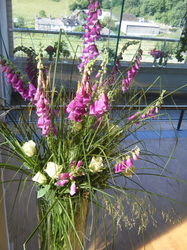 Another gorgeous day !! 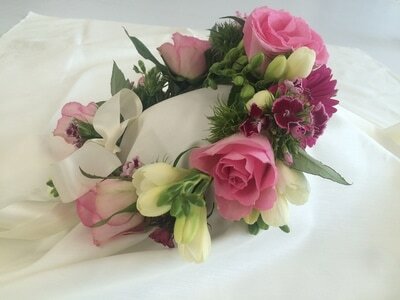 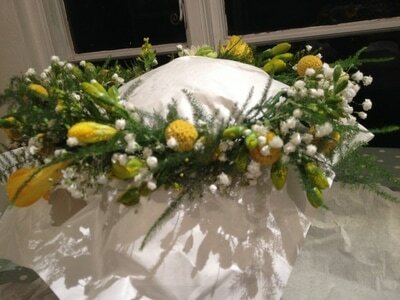 This was a pretty coronet headdress I made for a little girls naming ceremony. 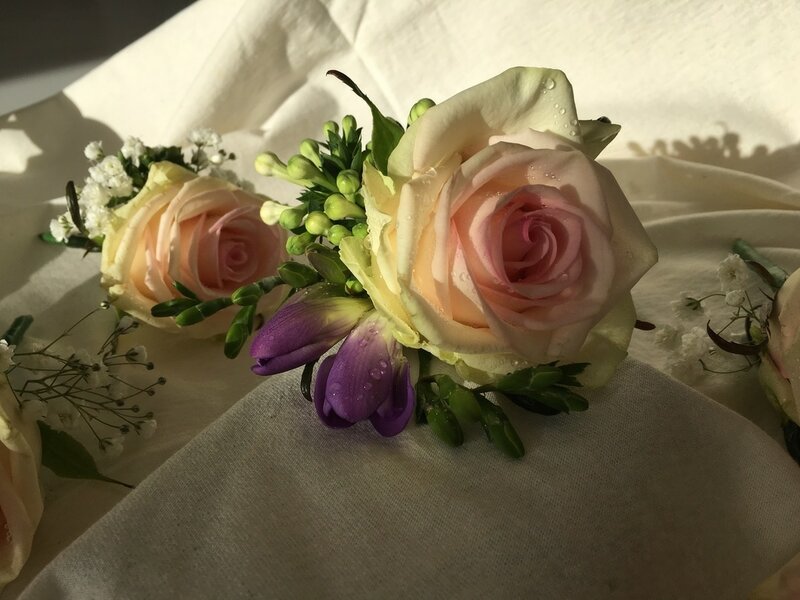 This was an amazing wedding to be part of, as one of my daughters best friends, her 11 bridesmaids were all woman I had watched grow up together. 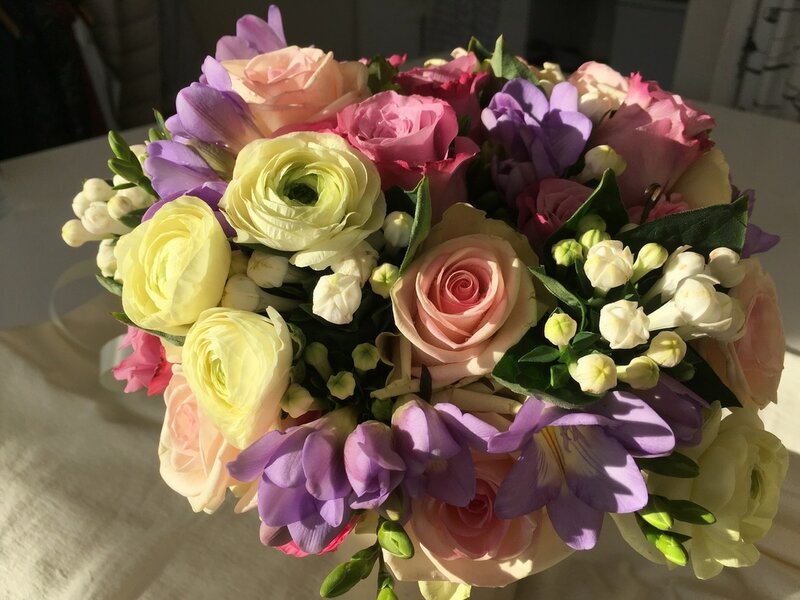 A truly beautiful day in every way. 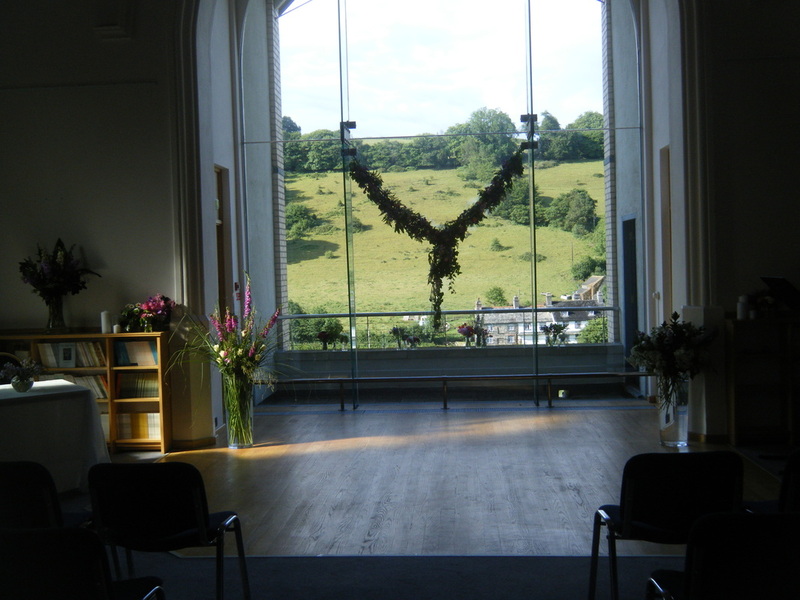 This wedding was at the Old Chapel, also known as Calstock Arts. 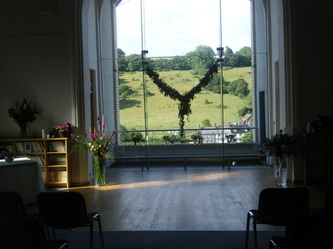 It is the most fantastic venue with a stunning view. ​We had lots of fun deciding what to do here ! 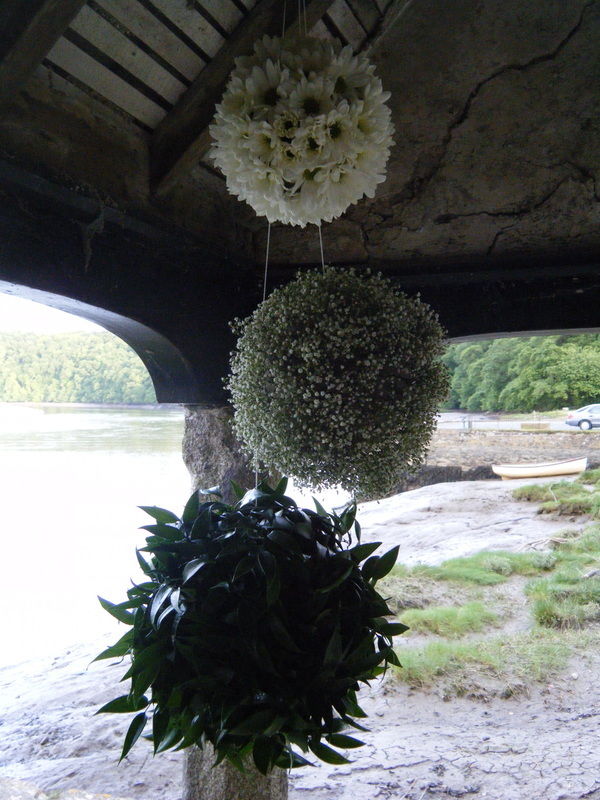 Tony & Lily got married in the beautiful Boat House at Pentillie Castle. 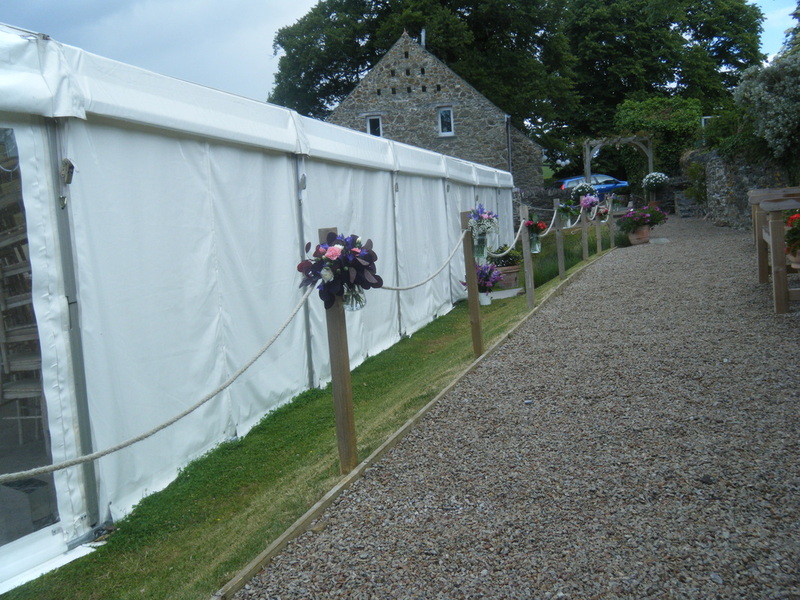 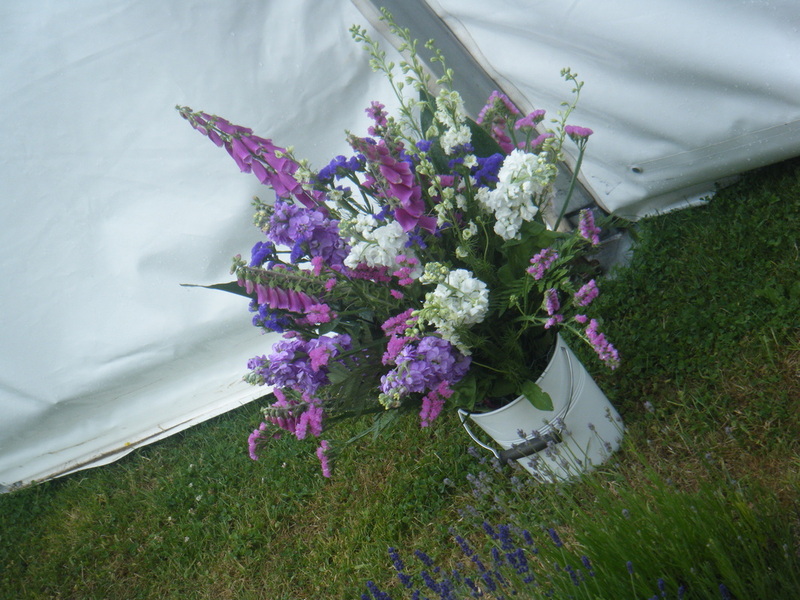 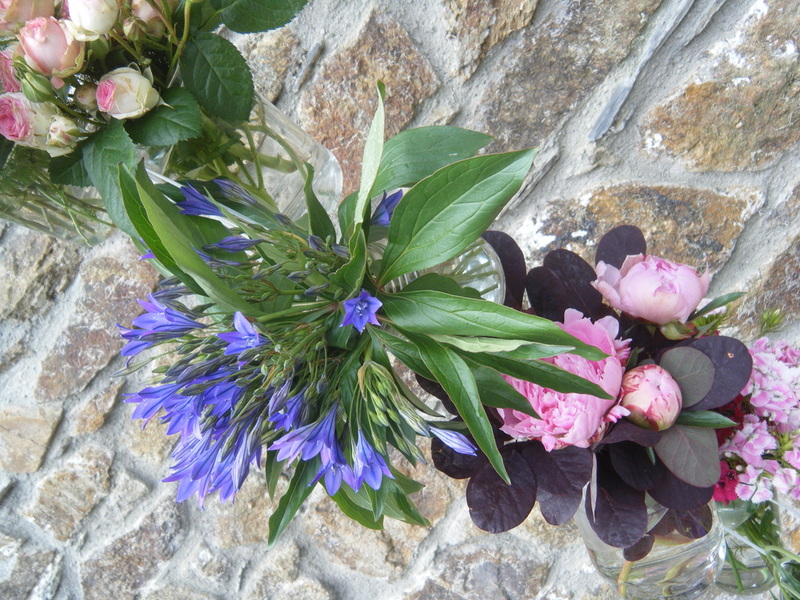 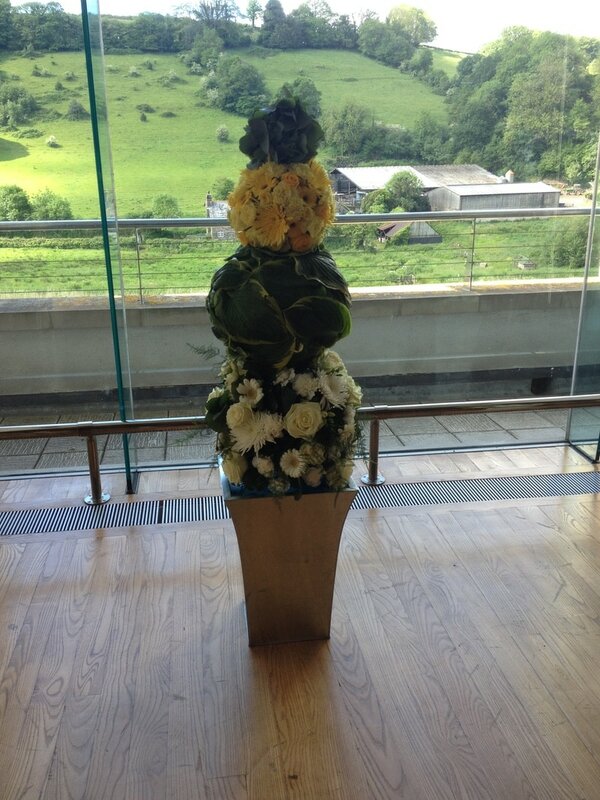 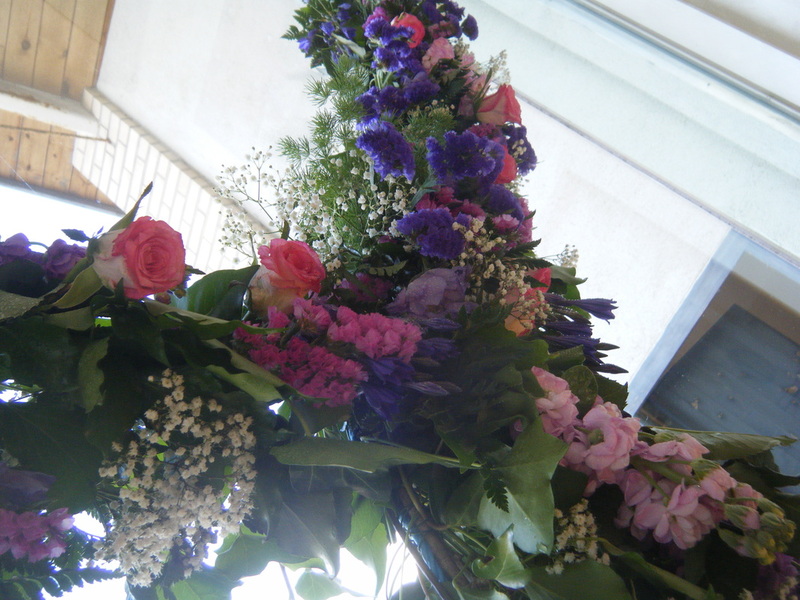 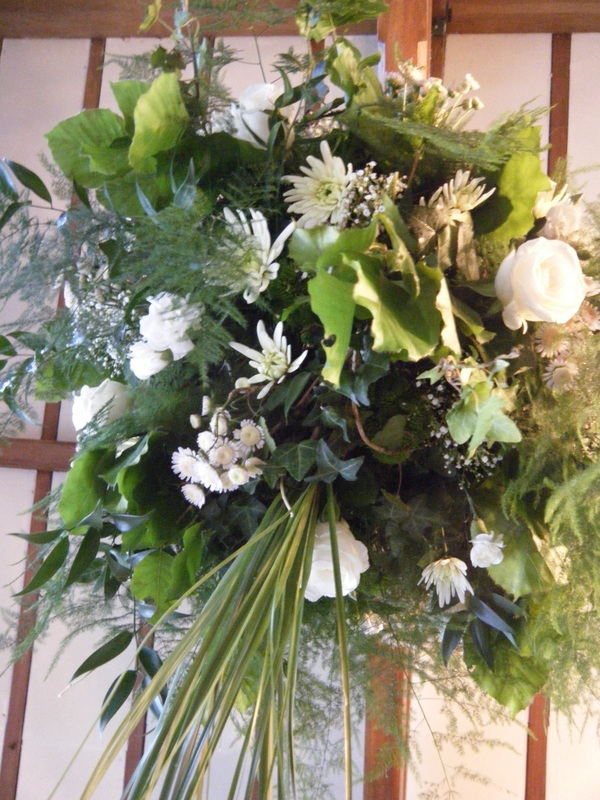 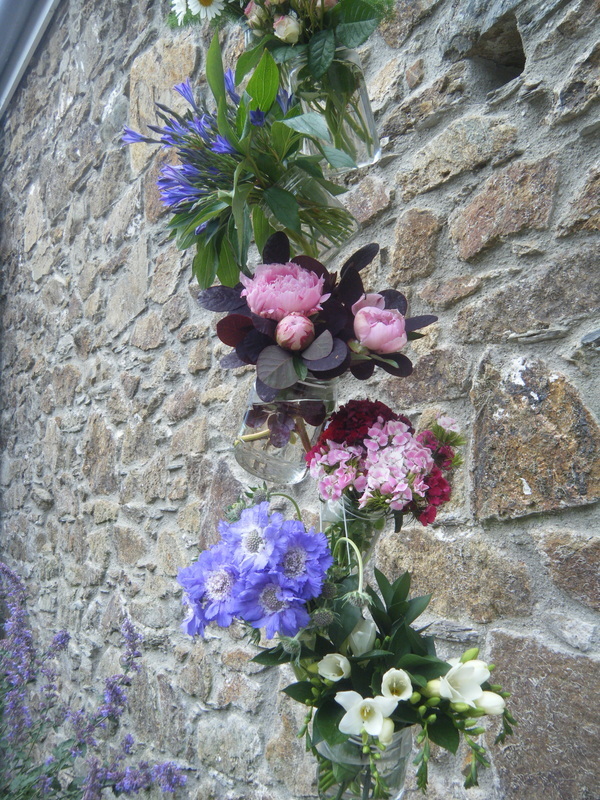 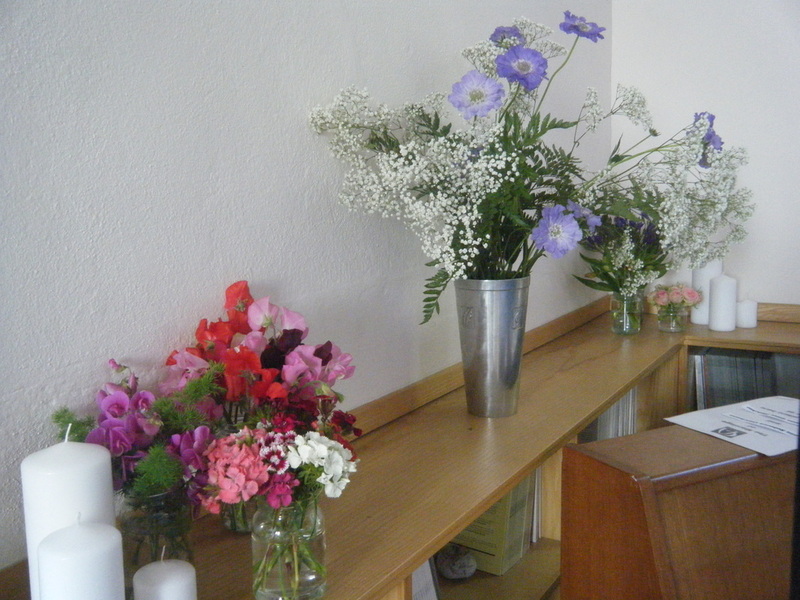 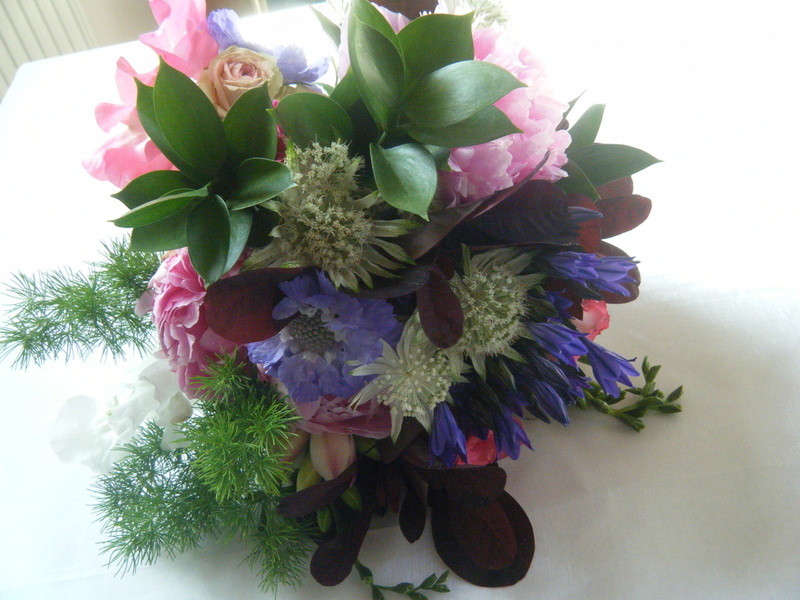 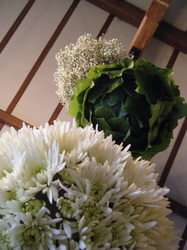 They wanted flowers that would be easy to transport to the reception at The Old Chapel, Calstock. 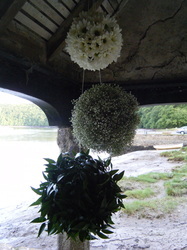 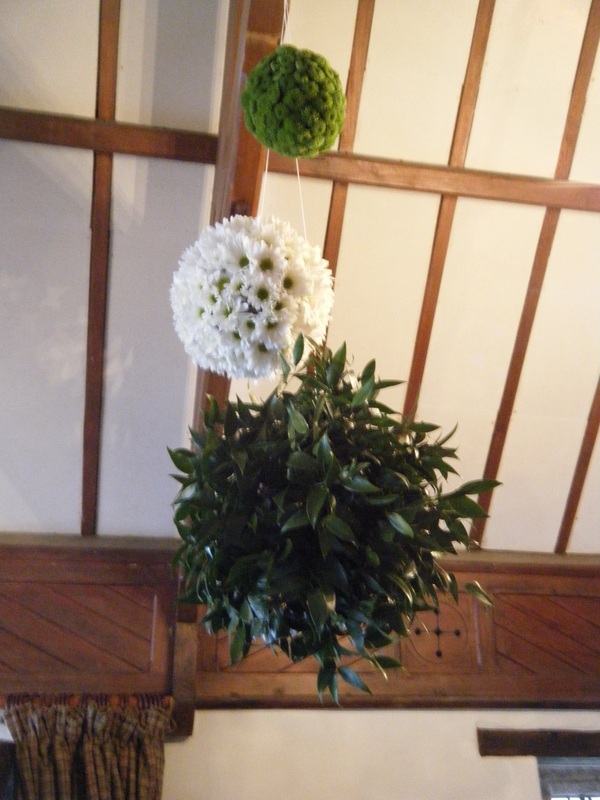 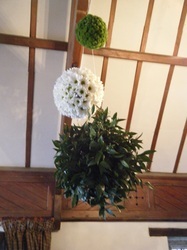 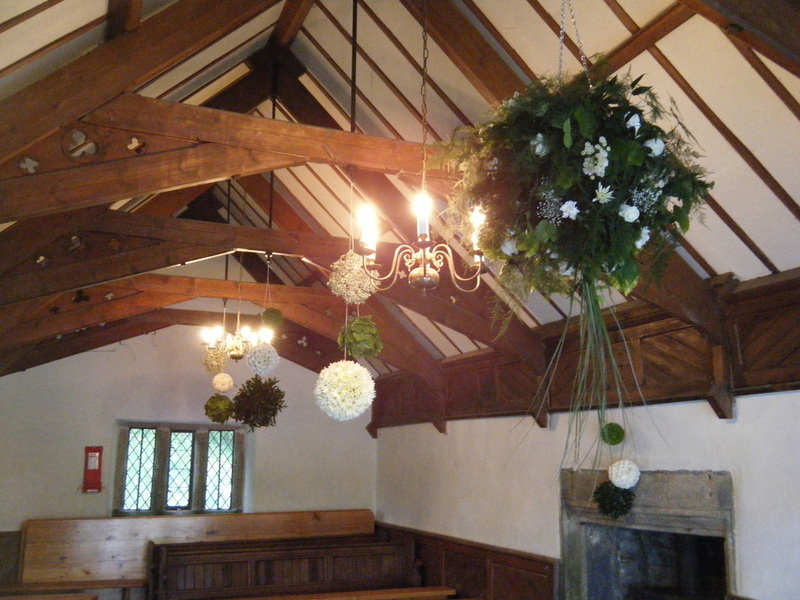 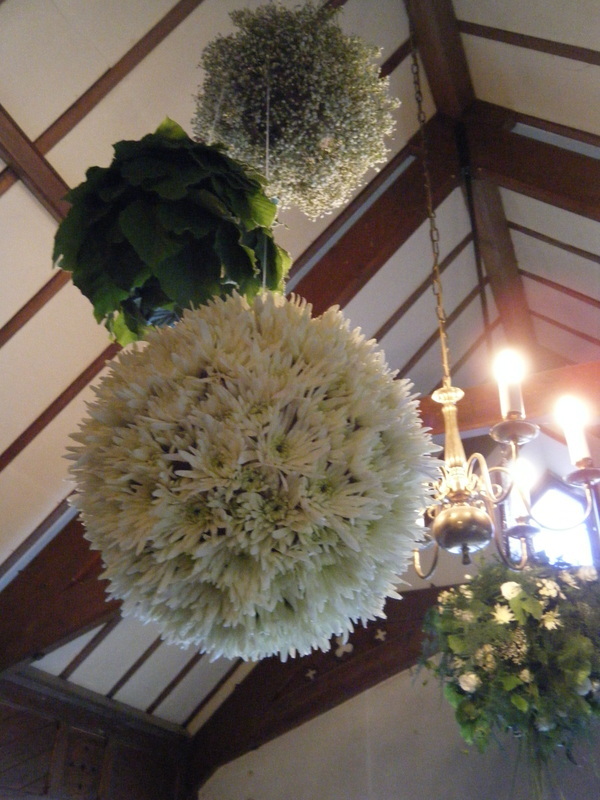 I designed these flower 'baubles' to hang in the eaves of the boat house and then they were cut down and carried to the reception by the guests. Here they were sat in various bowls and used as table arrangements. Tori & Mike got married at The Horn of Plenty near Tavistock. Tori wore an amazing vintage lace dress that I altered for her and a satin bolero jacket that I made. Mike and his groomsmen wore satin ties that I made. 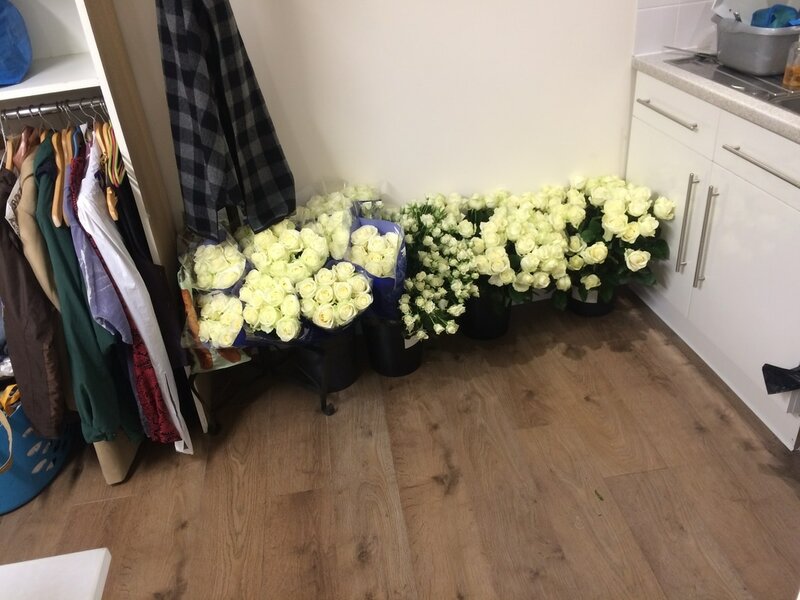 Tori wanted roses for her flowers and had hope to be able to supply most of them from her garden. 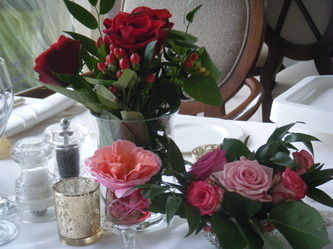 Come the day I used some locally sourced roses with some that Tori picked amongst them. 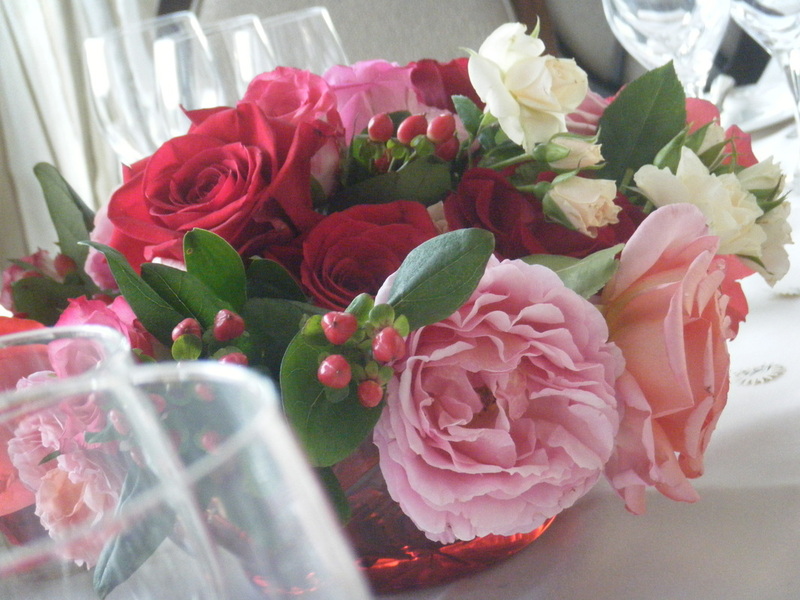 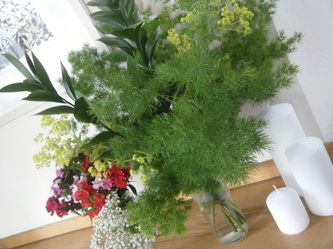 This gave the flower arrangements and bouquet a beautiful fresh picked look and the scent was magical. 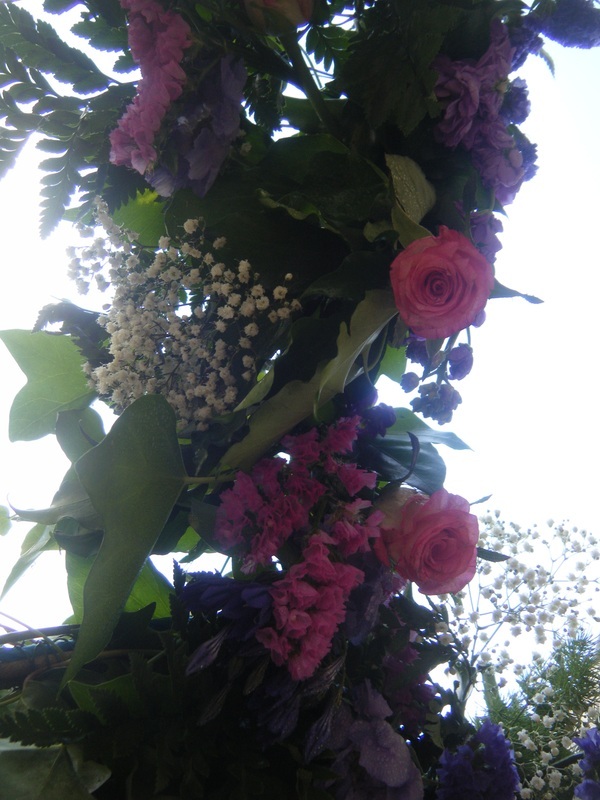 It was a real privilege to be part of this wonderful day. 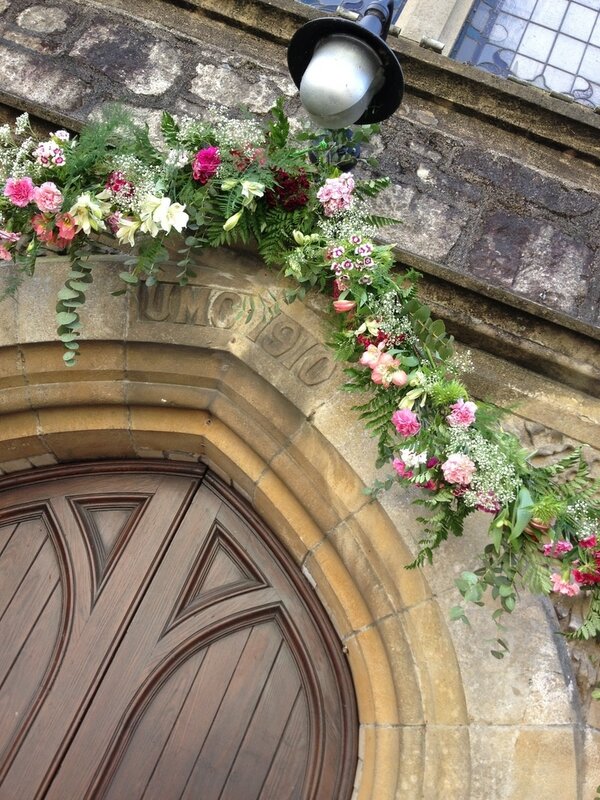 Ella and Rory got married at The Old Chapel, Calstock and then their reception was held in a marquee in the amazing gardens of Lantallack, near Saltash. Ella & Rory wanted an english country garden feel with the flowers displayed in mis-matched china and a array of jam jars. 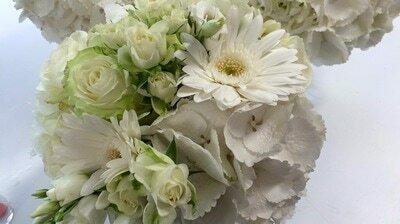 This theme made for a beautiful uncontrived natural look despite that fact that every stem had in fact been lovingly 'arranged'!! 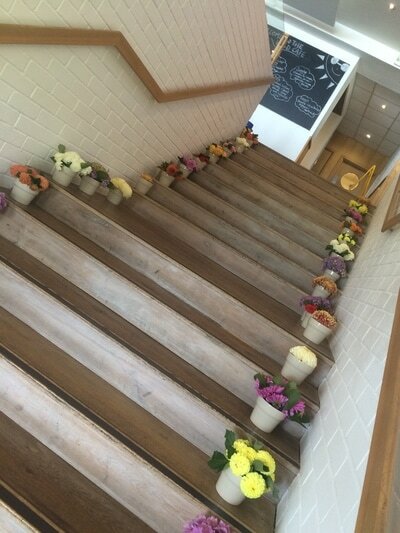 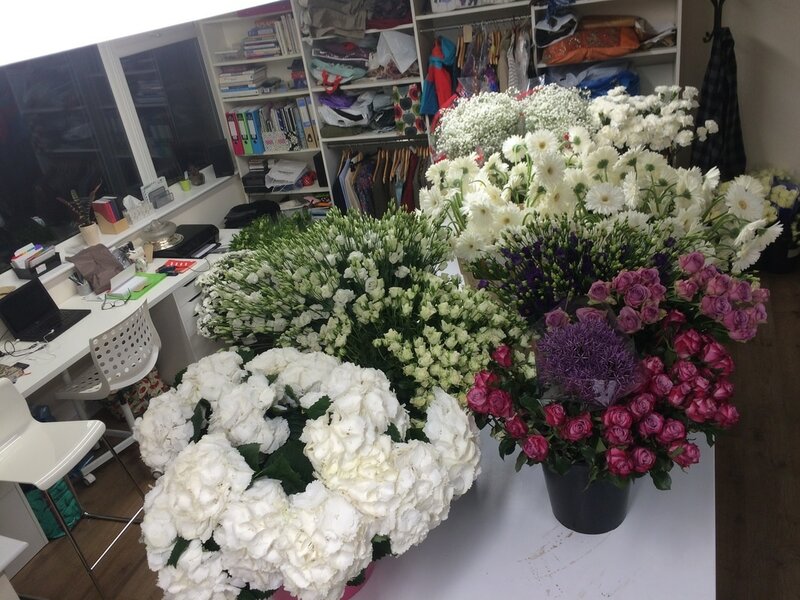 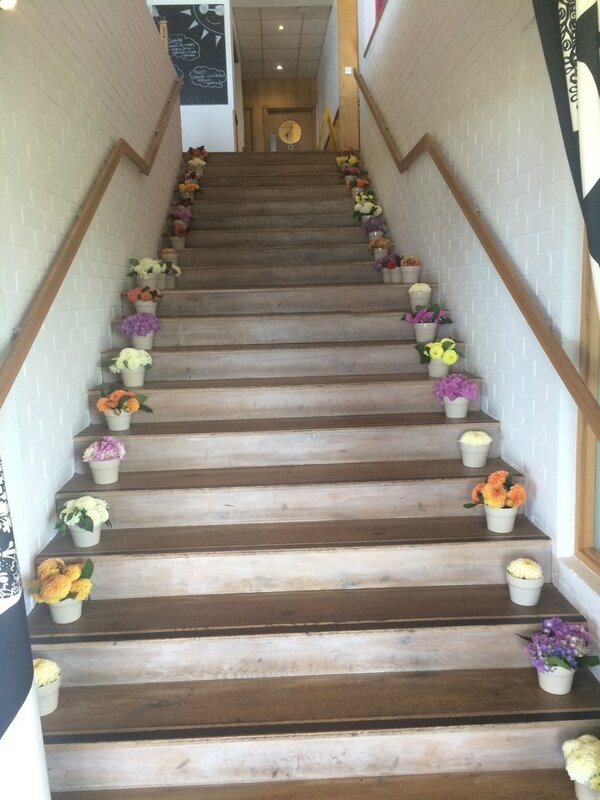 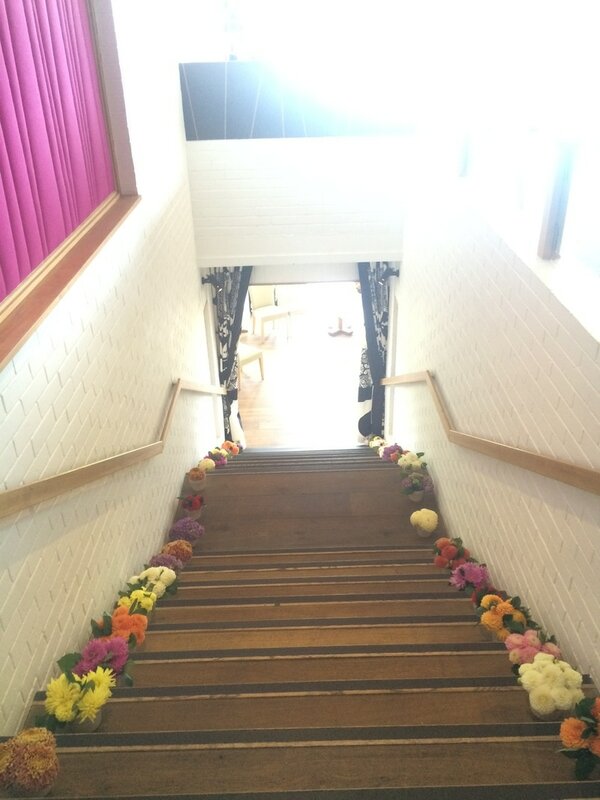 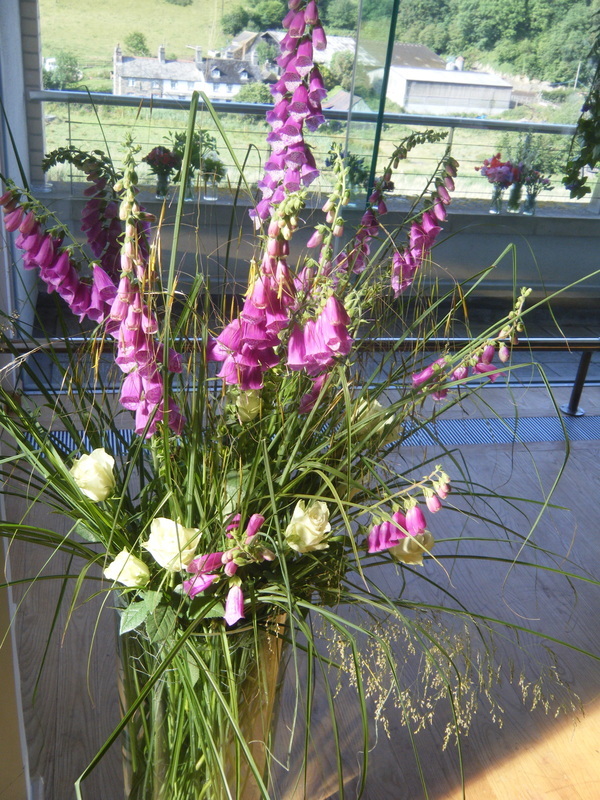 We used as much locally produced flowers as possible. 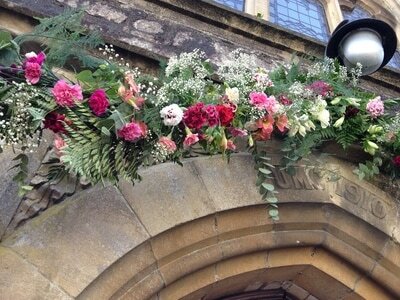 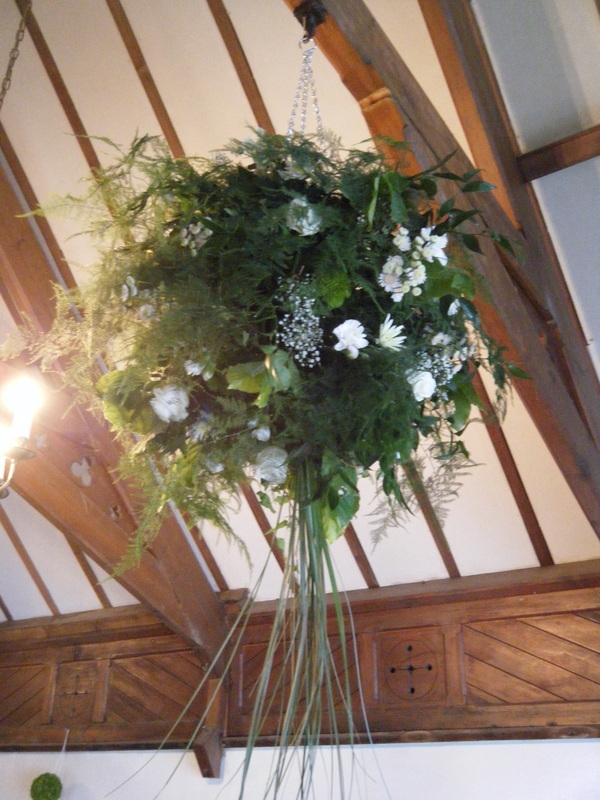 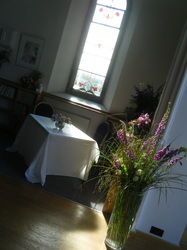 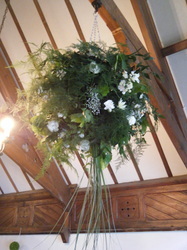 The garland hanging in the huge window at the chapel was a real triumph!! 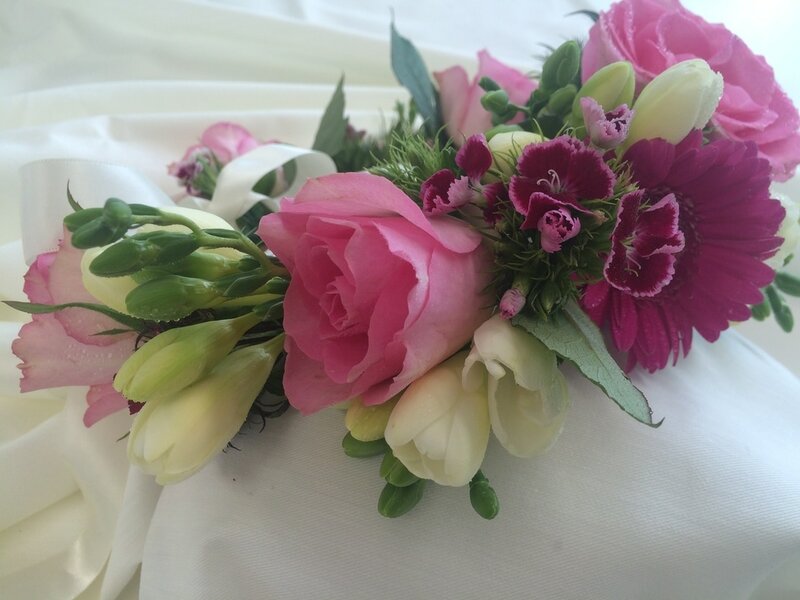 Ella gave me a free rein really and her trust in me and my ideas was amazing. 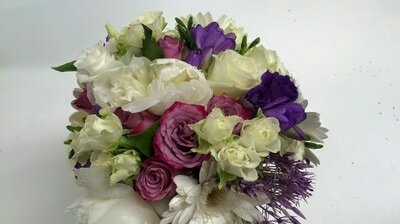 I enjoyed working with this family so much.